I do not know how to start this post as I am still in shock after having watched "Lost River". I have been trying to elaborate my thoughts about the movie for quite a while and I think I am unable to create a linear narration so I will throw them all here for anybody who might be interested in experiencing the first film directed by Ryan Gosling. 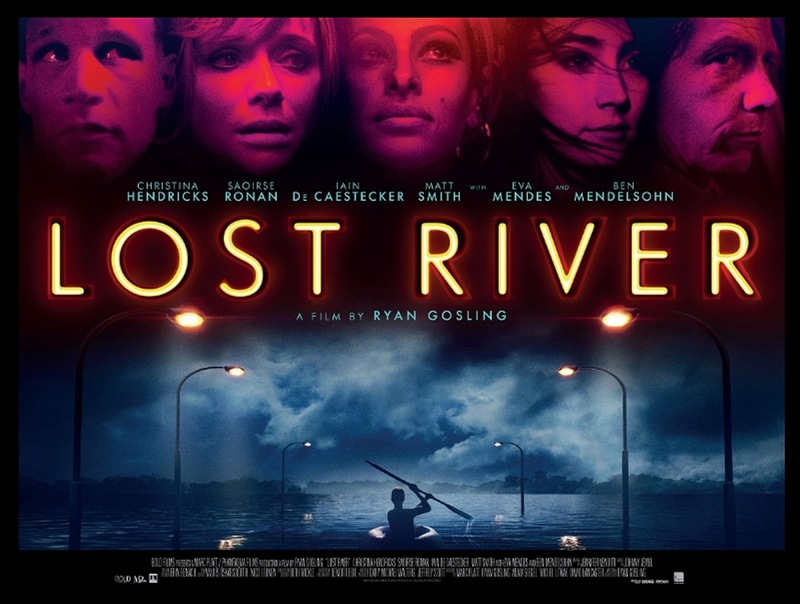 Lost River is a very difficult movie to classify in our "tag" world, somebody could argue that it is an "auteur" movie with all the connotations that that word brings to the table, some others could say that it is an experimental movie with a narrative arch which brings the spectator from "a" to "b". However, I firmly believe that it is the result of Ryan Gosling's thoughts, desires and influences as a filmmaker. Ryan Gosling knows exactly what he wants to tell and he gives to the visual part of the story a very specific weight, which is considerably 200% of it. It is very clear to me that he knew how the movie had to look like and in his inner interior (is that right? :D) he wanted it to be controversial and bold, both (one of the production companies is called "Bold films"), and for him to express his voice (and what a voice!) he had to bring a cinematographer whose work has been always controversial and stylistic, Benoit Debie. Mr. Debie might not be a super well known cinematographer but he definitely has a very interesting career, from Fabrice Du Welz and Gaspar Noe to Harmony Korine and now Ryan Gosling, Benoit Debie knows how to surpass everybody's expectations and how to create amazing and bold moods with a lot of colour and desires, always within the very thin line which separates darkness from "darkness" and being successful all the time! He knows very well how to manipulate the audience with the palette of colours that he uses, as in Irreversible (2002) and Colt 45 (2014) or Spring Breakers (2012) to name a few. He is even working with Wim Wenders now on The Beautiful Days of Aranjuez. Regarding Ryan Gosling's skills as a director, there are certainly some gaps in the narration of the movie (as in any) but he tells the story in an impressive way. Definitely he learnt a lot from the directors he has worked for, Terrence Malick, Nicolas Winding Refn, Derek Cianfrance and Shane Black, etc. The way he frames, the way he choses the focal lengths, how he follows the characters or what he wants to not show are things that only a very mature filmmaker can do, and let us say that "Lost River" is his FIRST feature film ever. And he is a very very good actors' director! Ben Mendelsohn is really good and also the rest of the cast. With a very difficult script, Ryan Gosling makes the actors feel real and linked to the world where they are, a world of decadence and sadness, but also with a little bit of hope. I know Ryan Gosling got a lot of bad critics with "Lost River" but it is my impression that those critics were that bad because of Ryan Gosling himself, specially in Cannes. I am pretty sure that if any other filmmaker in the world had presented a FIRST MOVIE like this one in Cannes, everybody had been clapping at it. I could digress all day long about the movie but I think that it is better if you just watch it and experience it. I am very glad I saw it and I am looking forward to receiving my blu ray copy some time soon. I'm in. Now to go figure out how to see it!